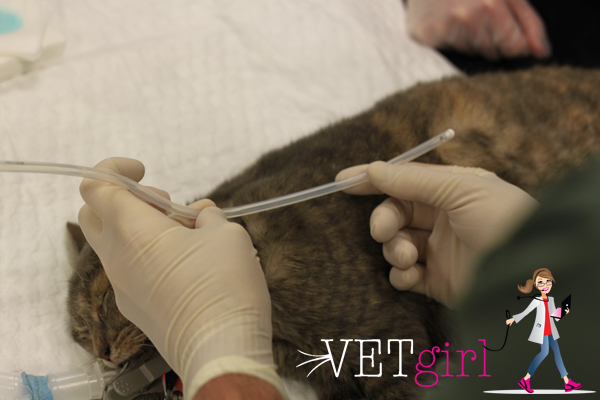 In this VETgirl online veterinary CE blog, we review how to place an esophagostomy tubes (E-Tubes). 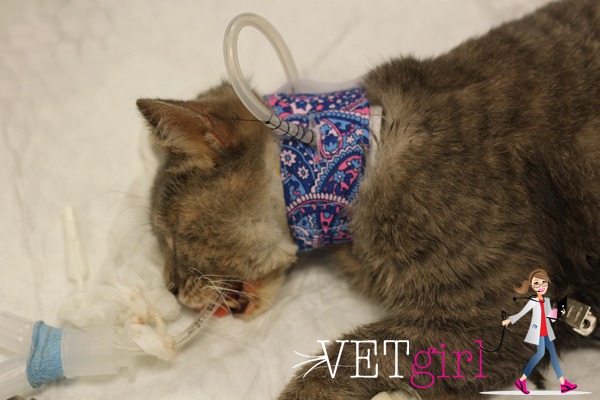 These are a wonderful way of delivering enteral nutrition in anorexic cats. Esophagostomy tube placement is performed under general anesthesia to allow intubation of the patient. 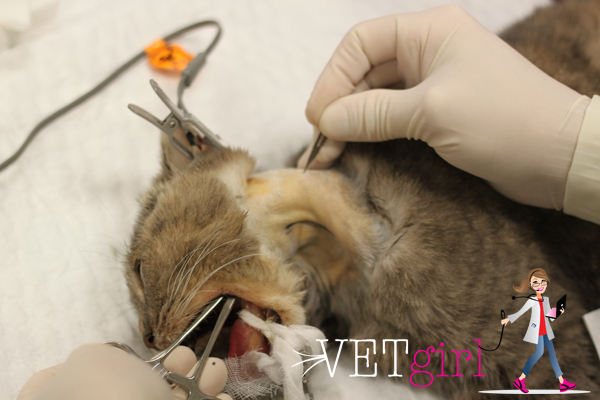 The patient is placed in right lateral recumbency and the left lateral and ventral cervical area is clipped and an aseptic preparation performed. 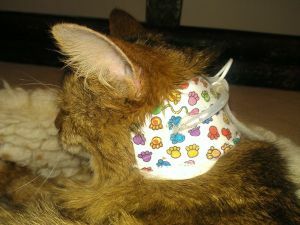 For cats, a red rubber or silicone tube is used, ranging from 10-14 French. A curved hemostat (Kelly or Carmalt) is introduced per os into the proximal esophagus. The forceps is pushed through the small stab incision and the feeding tube is grasped. 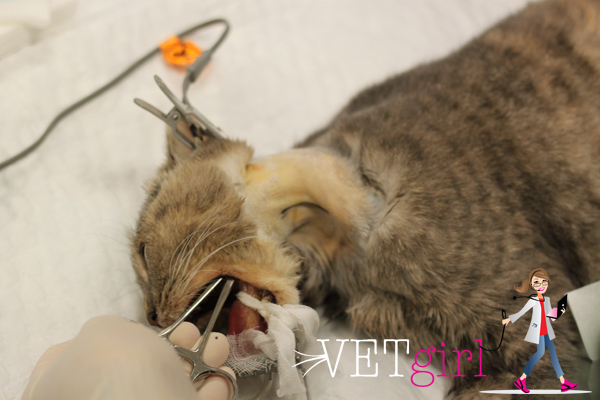 The feeding tube is then pulled into the esophagus and out the mouth. The tube must be then turned around so it goes directly down into the esophagus. It should be manually pulled out through the mouth and turned directly back down the esophagus. The feeding tube is advanced to the previously marked position and secured using a purse string and Chinese finger trap suture. A lateral thoracic radiograph is taken to assess placement of the feeding tube into the distal esophagus. Most importantly, before the tube is removed, the voluntary caloric intake by the patient needs to be confirmed. 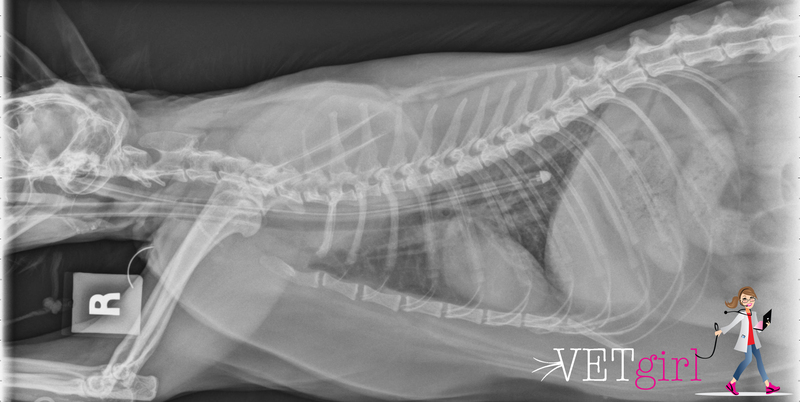 This often requires the veterinarian and owner to determine how much the cat is eating on their own each day. - Type / Kcal of that food? This will help ensure the tube is not removed prematurely before we can determine if the cat is eating enough on his or her own. If the owner is feeding 100% RER via the feeding tube, the patient may not wish to eat due to a sense of being full. 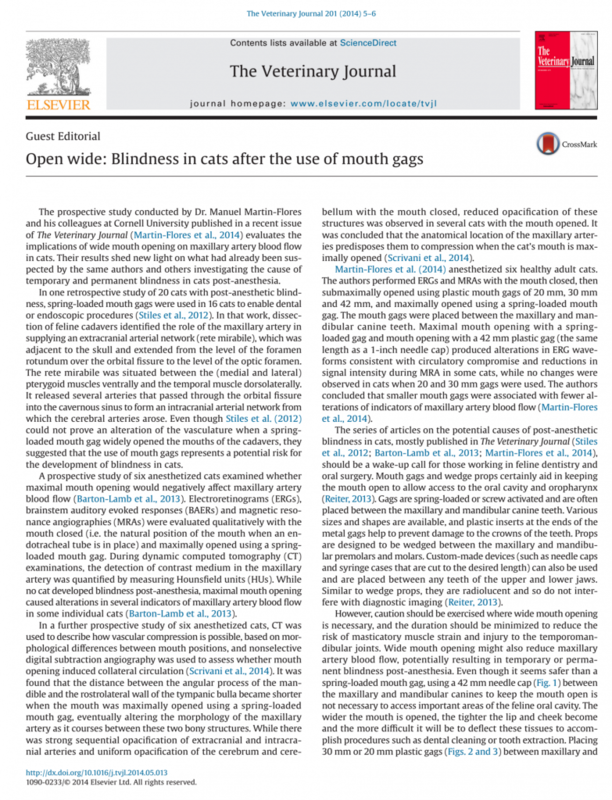 Once comfortable with the improvement, the veterinarian may instruct the owner to decrease tube feedings and encourage more voluntary intake by the patient to assess the cat's appetite. Initially, the feeding tube caloric intake is decreased by 25-33%, allowing an opportunity for voluntary intake. If the patient begins to eat, the following week, we then reduce the tube caloric intake by 50%, and monitor voluntary intake. Each week, continue to reduce feeding tube caloric intake to assess voluntary, oral intake. Once the patient shows a normal, voluntary intake of 75-100% RER, we can feel more comfortable removing the feeding tube. 1) Weekly, check the site for abnormalities. Feeding tubes should be checked for discharge, inflammation and infection. 2) Along with a general examination and patient assessment including vital signs, tube bandages should be changed at least weekly. 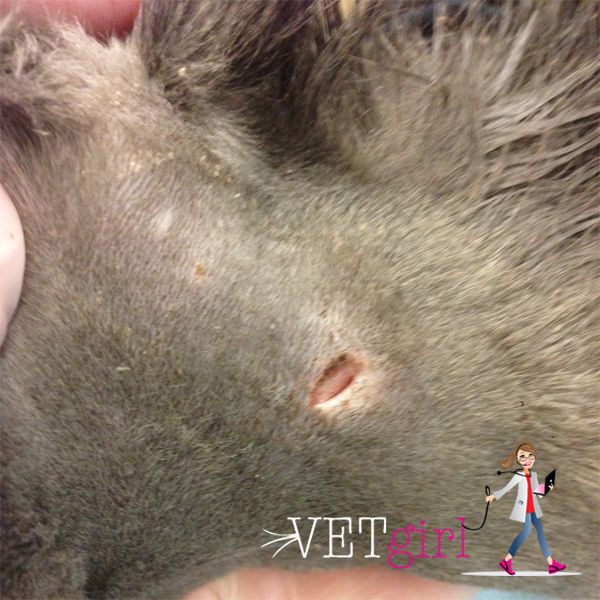 Once the tube is removed, it does not need sutures or any degree of surgical closing. The stoma site closes up remarkably, often in 5-7 days. Over the first few days following tube removal, the site is kept covered with a clean bandage and triple antibiotic. - Not an uncommon occurrence. - Prevention is easier than unclogging when there is a problem. - Make sure that the diet is smooth in consistency and there are no chunks within the food with appropriate blending. - Flushing the tube before and after every use is best to avoid clogging. Vigorous flushing may help dislodge a clog, but can also cause the cat to vomit/regurgitate. Some advocate flushing the tube with Coca Cola – which can be placed into the tube and allowed to sit in the tube for 5-10 minutes, followed by vigorous flushing with water. A flexible guide wire or long small diameter polypropylene catheter can also be considered (not by the client) to help try to relieve a clog. Why do you have to place an E-feeding tube in the left side of the animal? Is it possible to do a right lateral approach, if not was is that contraindicated? Based on the anatomical location, it should be only performed on the left side. Have you been using e-tubes in management of CKD when the kitty will not take in calories sufficient to control weight loss ? Absolutely – especially if they have cardiac disease and can’t handle SQ fluids also. You can hydrate with oral water and feed a low protein slurry food. Why do you not place to tube into the stomach? Great question – E-tubes are just sitting in the esophagus. If you use a G tube, that’s in the stomach. There is some thought that leaving a tube in the stomach (e.g., a nasoesophageal vs. nasogastric) can “tickle” the stomach resulting in more vomiting, but a recent paper out of Michigan State proved it likely doesn’t make a difference. Hope that helps! I had a cat who briefly had an etube earlier this year and it was in the same location you show here. 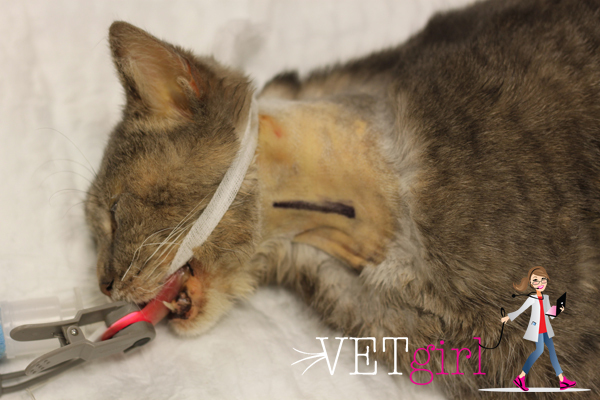 When another cat required an e-tube recently, i expected my vet to put it in the same location, so I ordered one of the collars you show in the pictures, only to find that the tube had been placed just under his left jaw almost. I was very surprised and assumed there was a standard, since the collars are sold assuming a placement similar to this one. Is there a best practice on this that might not be well understood in the vet community yet? This second tube came out last night and I’m taking him back to get it replaced. I’d like to explain to the doc why this site is a better idea, apart from the fact that it’s easier to inspect on a fluffy cat (safer for voicebox, etc). Thank you for putting this guide up. 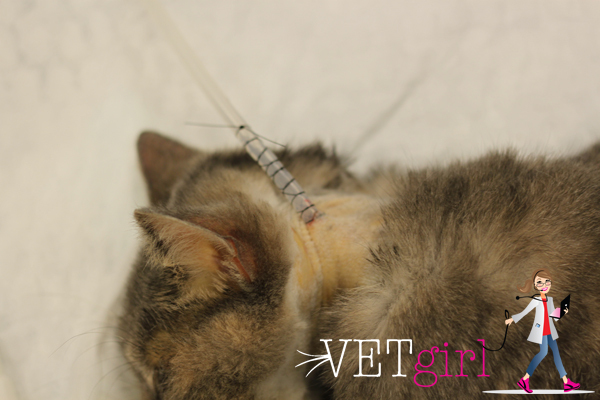 Thanks for the guide – to the point, great photos, although I suspect it deliberately forgot to mention about turning the tube around and pushing it down the esophagus after applying the trap suture (assuming that other vets like me read this). 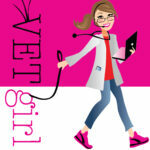 thanks also for the webinar you did with vet education earlier this year! Thanks Chris. Yes, the fine details… Will add in! Appreciate it!!! Is it possible to push through the small stab incision and grasp the feeding tube and instead of pulling into the esophagus and out the mouth, should be pushed down further to direct the tube towards the stomach ? It’s honestly clinician preference – whatever works for you successfully with turning the tube around too! 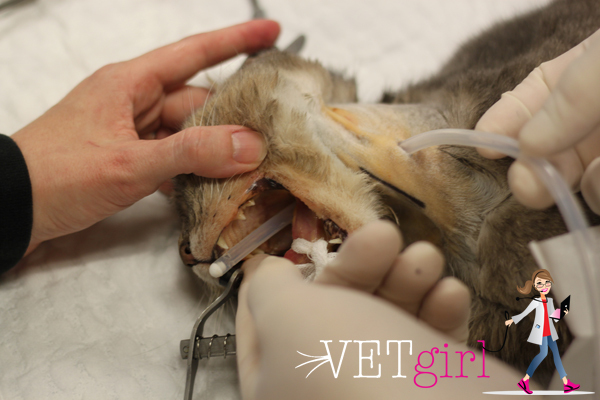 Hi, once the tube is removed does the cat need to fast until the hole in the esophagus has healed or can they just continue eating as they have done? 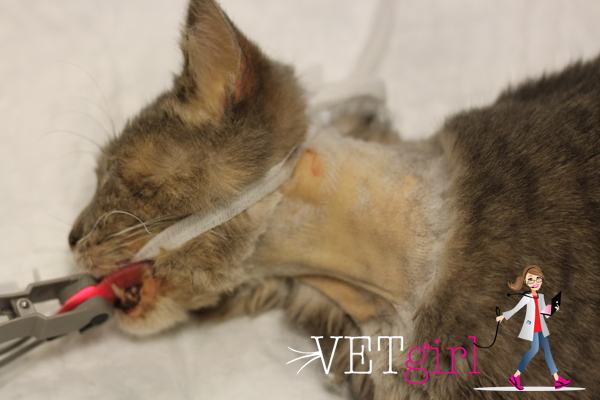 Because these cats are usually very sick, what is your anesthesia protocol to minimize adverse effects while under anesthesia? They do need anesthesia so a safe, reversible pre-med like an opioid and benzo + general anesthesia. With practice, this procedure should just take about 10-15 minutes.